History is my passion. My love of old houses, buildings, furnishings, even trees, all come from this core obsession. So you can imagine my fondness for the Smithsonian Museum, and it’s all-but-endless ability to feed my curiosity. (I even interned there during college.) And so, when the opportunity came to me to save a small piece of this great institution, I pounced. Without knowing what on earth I was going to do with said souvenir. And, of course, this tidbit is made of iron and weighs about 1000 lbs. 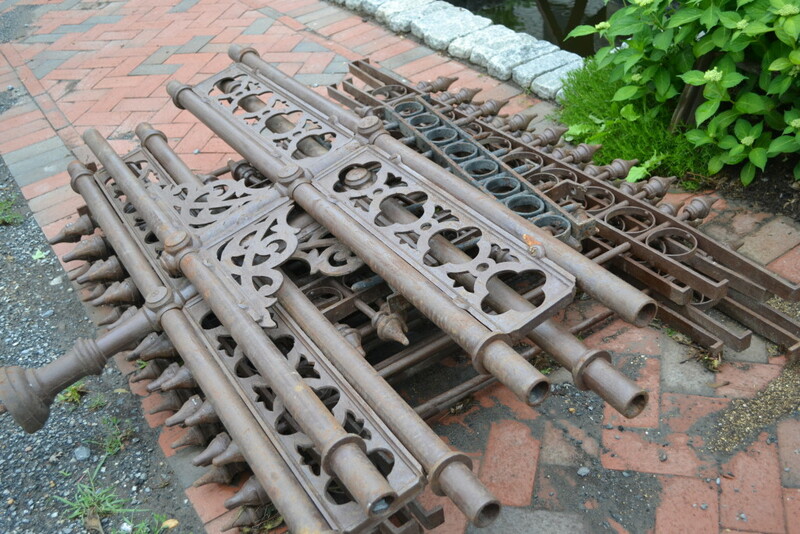 During a 1970s renovation, the iron trimwork was ripped from the iconic Smithsonian Castle and was headed for the dump. Fortunately one of the workmen on the site saw the beauty in the pieces, designed by Renwick himself and custom-constructed for the building, and had them put on his truck instead. As the pieces were solid iron, he couldn’t haul them all, but he saved what he could. From there they rested in his barn for over 20 years. He loved them, but didn’t have a vision for what to do with them. When he died, his family was going to do what the 1970s construction team had originally planned: take the pieces to the dump. But one granddaughter shared her grandfather’s fondness for them, and couldn’t see them trashed. And somehow or another she found my name and number, and called. 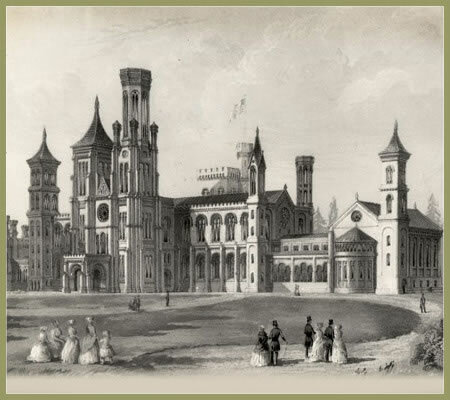 “Would you be interested in some iron salvaged from the Smithsonian Castle?” She spoke these words so simply, that I wasn’t sure I’d heard her correctly. Seriously? From THE Castle? Designed by Renwick? An icon of Washington, DC for over a century? Um, YES! As the heavily-laden truck rumbled into our drive, I was giddy with anticipation. And was not disappointed. Here’s the stack. While it may not look like much, it was enough to weigh down a sizable pick-up truck. 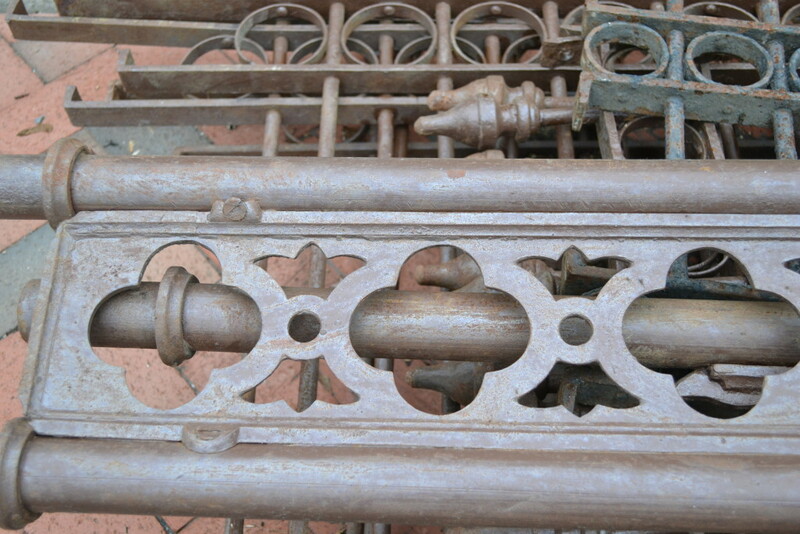 There are both grates and the long, heavy trim pieces. Each piece takes 2 men to carry. There were 8 pieces of fencing/window grating, each 4-5′ wide. Plus the two large horizontal pieces on top, which measure about 6′ wide. Truly a treasure. Detail of the long trim pieces. 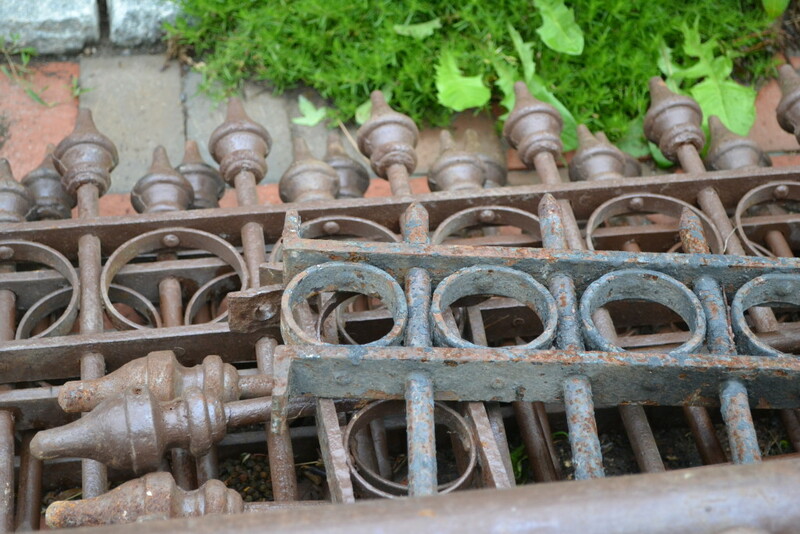 The rust-colored pieces are the grates from the Castle. The smaller, black piece is actually unrelated, but found it’s way into the Smithsonian stack. I absolutely LOVE these irreplaceable iron pieces. And now I’ve had them for over 7 years myself. People have tried to buy them, so I’ve kept them hidden away – does that make me a hoarder? – just waiting for the perfect use: I want a garden wall, a gate. Or perhaps I should pick one or two and hang them on the exterior wall of our house, which was built just a few decades after the Castle’s construction. The possibilities are endless, but once I decide, all the other options go away. . . So for 7 years they have languished and I have pondered. Not too long ago Jared Herman of Olde Towne Historic Landscape partnered with us to create the stunning patio area in front of the Main Barn. Eventually Jarrod, a true artist, nosed out these precious pieces. I knew as soon as he saw them that he wanted to work with them. These pieces just have that effect on you. But Jarrod had a vision. And so, these heavy, Renwick-designed, custom-made, pieces of American history are going into the garden here at Chartreuse & co, where you may see them up close and personal, and marvel at their beauty, construction, and epic tale. What a wonderful way to use these great pieces of History. Thanks, Pamela. I can’t wait to see how it all turns out. Pictures will be forthcoming!